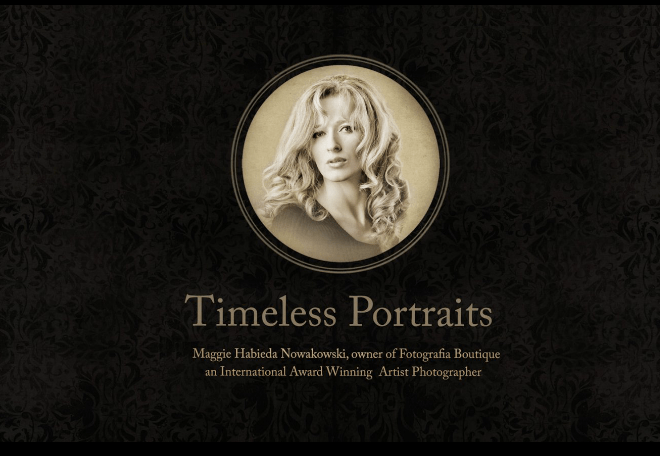 Maggie Habieda is a creative professional portrait photographer, a successful entrepreneur and a philanthropist. Maggie graduated from the Ontario College of Arts and is an international award winning portrait photographer. Maggie is the owner of the beautiful 1500 square foot Fotografia Boutique, a high end photography studio in Oakville Ontario. Her large framed canvasses, Italian-made designer photo books as well as unique photo purses are her trademark. Maggie’s twenty years of experience in fine art and unmatched combination of creativity and technical skill allows her to capture people as they dream themselves to be seen. Fotografia Boutique is recognized nationally and internationally for its professionalism, innovation and quality of work. Over the last few years Fotografia Boutique has received numerous awards for the quality of photography they produce, while Maggie herself has been featured on the cover of “Top Choice” magazine. Maggie has a close promotional partnership with Lifetime Fitness in Mississauga and expanding beyond and to the US. Her lobby displays often feature live musical entertainment and free roses to all women members who take the time to stop by and explore a portrait opportunity. Maggie has photographed top Ontario and local politicians, performing artists, and senior corporate executives. She is sought out for her captivating portraits, judicious editing, and creative but professional posing. Maggie’s warmth and unique charisma truly makes each client’s experience a very comfortable one in the studio setting. Her approach to business is simple: treat all people with the respect and love that you wish to be treated with. Because of her truly “human” approach, she has as many new friends as she has new clients. When you enter the spacious Fotografia Boutique, you feel like you’re in an art gallery but when you sit for a Maggie photo shoot, you know you’re in the lens and sight of a hard working successful professional. Also, Maggie loves performing arts and she organized the Colours of Love gala concert in 2013, with the second one in the plans for this October. Maggie has a philanthropic side to her – she supports Hats on for Awareness – organization dedicated to raising awareness, understanding and widespread acceptance of mental illness and addiction, Epilepsy Ontario, and the Mississauga Arts Council. Maggie has received hundreds of honours including: WPPI (Wedding and Portrait Photographers International) “Photographer of the Month” during 2010 and 2011, 1st Place Child Portrait International, 1st Place Portrait Book Canada 2012, 1st Pace in Fashion Canada 2013 The “Tibor Horvath Award of Excellence”, “Wedding Portrait Best in Class” and Judge’s Choice Award at the 2011 Professional Photographers of Canada, Ontario Competition as well as countless “Best in Show” photography artworks presented in Canada and the United States. She also has images in the prestigious Loan Collection of Canada. WPPI. In 2014, Maggie was awarded her “Masters in Photography” at this event recognizing her worldwide as an industry leader. Best Photography Studio Oakville 2014, 2015. Top Choice Photography Studio 2015, 2016. Brilliant Minded Women 2015, Award of Excellence for best Photography Studio form Canada Chamber of Commerce 2015, as well as Woman Entrepreneur of the Year 2016, Oakville Chamber of Commerce Champion Award two years in a row. Maggie took all our POLcast photos. Thank you!